As she’s getting older now and definitely has her own opinion on things, I let her choose her own party theme this year. We looked at some different options online and in the stores, and in the end she (unsurprisingly) chose a Frozen theme. And once we had decided on Frozen, I knew I wanted to try my hand at an Elsa cake. I’ve seen those cute doll cakes a number of times, and I figured this was a great chance to give one of my own a try. There are a lot of different methods out there, and most of them involve multiple pans. I wanted to simplify it a little, and I was able to get the process down to just needing one bowl to bake in. Wrap a cutting board or cake form in aluminum foil; set aside. Prepare the first cake mix according to the box instructions. Spray the inside of the batter bowl with cooking spray, lightly dust with flour and then pour in the batter. Bake in the center of a 325 degree oven for about 60 minutes. Remove from oven and let cool in bowl on a wire cooling rack for 15 minutes, then invert onto the rack and let cool completely (I let mine cool overnight). Repeat with the second mix. While cakes are cooling, prepare the frosting according to the directions (or use your own favorite buttercream recipe). Tint with blue food coloring until you achieve the color of Elsa’s dress (hold your doll up to the frosting to try and get a close shade match). Once both cakes are completely cooled, trim the bottom of each cake flat. Cut a small circle out of the middle of each piece of cake, about 1.5″ wide. It needs to be just big enough to fit the doll’s legs into it. 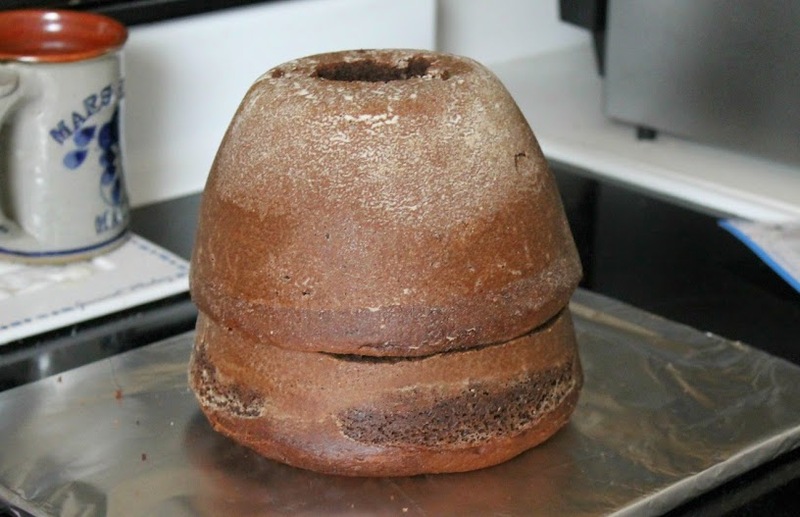 Next, cut about 2″ off the bottom of one of your cakes. Spread the slice with frosting then take the second cake and place it on top of the slice, creating the shape of the doll’s dress. Frost the entire cake, using extra frosting to fill in any gaps or bumps, until you have a smooth dress. Remove the doll’s skirt and wrap her leg in plastic wrap, then side her down into the center of the cakes. Finish smoothing the frosting up to the doll’s waist. At this point, my daughter came into the room and started bouncing around excitedly. I hadn’t told her the kind of cake I was doing, and my husband had managed to keep her entertained in another room up until then. I was getting ready to add some piping to do ribbons and snowflakes on Elsa’s dress, but my daughter wanted it left just the way it was. I did manage to get some blue decorating sugar patted onto her dress here and there to give her a little glitter. I finished by piping a few snowflakes on the board, and then making a “snow drift” in one corner to add her candle. It was much easier than I thought it would be! And once the cake is gone, you’ll have an extra gift for the birthday girl. 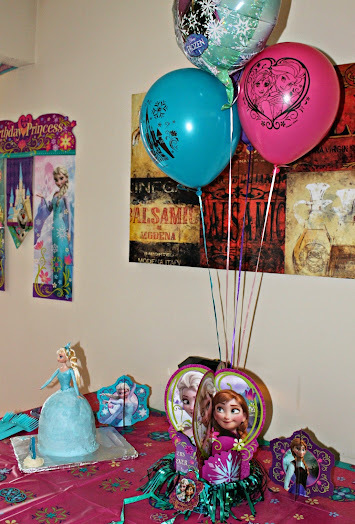 I decorated the table and the house with (affiliate) Frozen birthday party supplies Bubbles helped me pick out online. Tablecloth, centerpieces, a wall banner, latex balloons, mylar balloons, plates, cups and more. 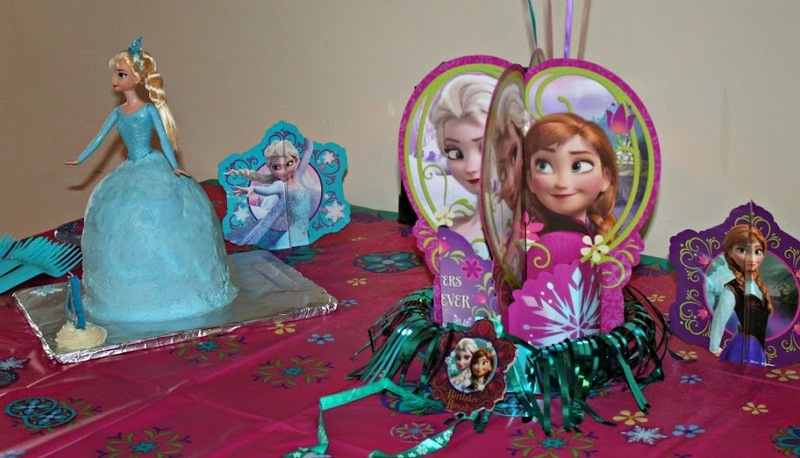 She was thrilled with her party and cake, and every time she grabbed one of our guests by the hand and said, “Come see the Elsa doll cake Mama made! It’s so beautiful!” it made me so happy that I had put a little extra effort into her cake. 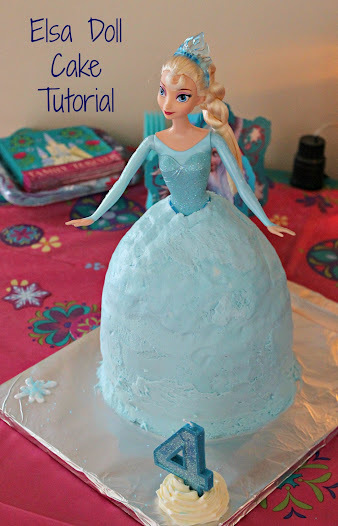 For whom would you make an Elsa doll cake? This is so cute! You can’t go wrong with a Frozen theme for a 4 year old birthday party. Thanks, Anne! Yes, it was definitely appropriate for this year. She’s already trying to plan next year’s, though – slow down, girl! Haha. Love Frozen! This cake looks so pretty! Thanks, Josie! We’re big Frozen fans too (even me!). Your cake turned out amazing! I have always wanted to try to make one of these before but have not had the chance to try it out. Thank you Tammilee! I’d been wanting to try one for quite awhile, too. I think I’ll be doing more, it was a lot of fun. What an amazing looking cake! I’d probably couldn’t pull this off though. I thought it would be a lot harder, actually, but it is easier than you’d think. I’m sure you could do it! Hello! 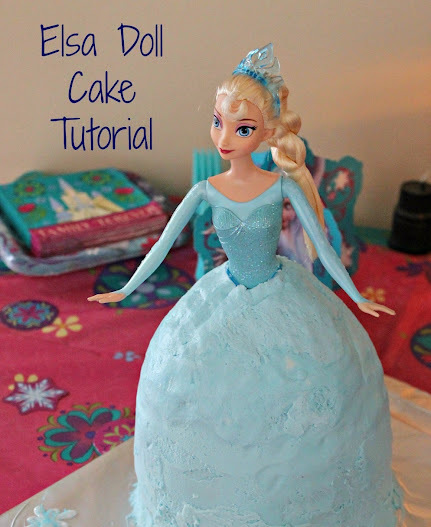 I had a couple questions about the one bowl Elsa Dall cake. First I was wondering if you tried cutting the top layer in half and icing them together to create three total layers of cake. I also wanted to know if you tried to smooth the connection between the bottom and top players by shaving some of the top layers off. Thank you! Hi Alyssa! I only used the two layers and I’ve never tried cutting the top in half, so I can’t speak to how that would work. I also didn’t shave the top layer; I just used a little extra frosting to fill the little bit of gap that there was. You could definitely shave the cake if you wanted, but you’d need a really good crumb coat to cover the exposed cake (and I’m not sure if it would affect the stability of the top).